The 23-year-old jumped into the lead after the penultimate round of the six-discipline omnium at Cali today but could not prosper in the final points race, finishing sixth overall. Karwowski and Waikato’s Racquel Sheath have been new to international omnium competition and the young pair have developed consistently. Third after the first day, Karwowski won the 1000m time trial in a world-class 1:01.921 and then topped all riders in the flying lap in 14.936s. This catapulted into the lead in the competition with the pivotal points race to come. However he was unable to go with the key breaks to finish in 12th place which left him in sixth overall, but only eight points from a place on the podium. 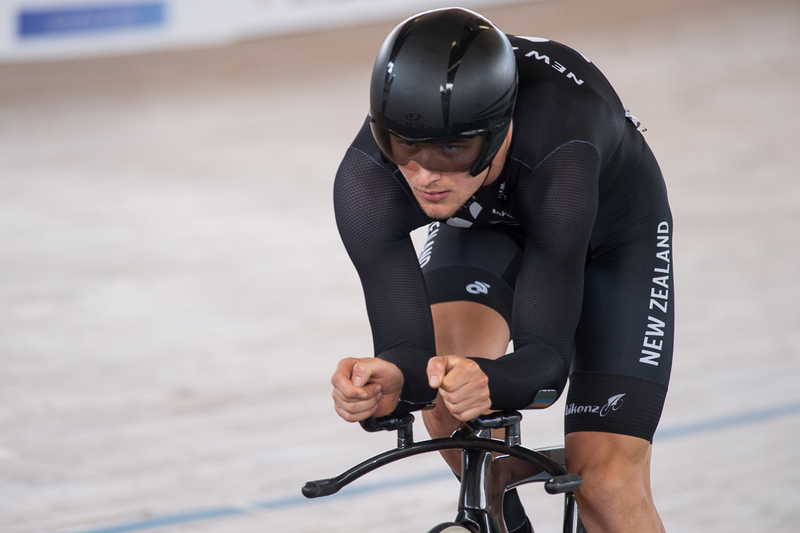 “There was good improvement from Cam especially in the timed events but he is still developing in bunch racing, and with the new format, the points race is critical,” said Cycling New Zealand head coach Dayle Cheatley. Sheath was 10th in the 500m time trial in 36.767s, 13th in the flying lap in 14.936s and 12th in the points race to finish ninth overall. Earlier neither Zac Williams (10.300s) nor Simon van Velthooven (10.314) managed to advance to elimination rounds in the men’s sprint, while Katie Schofield went out in the first round of the women’s kierin. Cycling New Zealand took the opportunity to blood a number of young riders to international competition, with Cheatley satisfied that the venture will bring rewards in the future. The riders return to New Zealand tomorrow where they will prepare for the Skoda national championships at the Avantidrome at the end of the month, which is the final selection trial for next month’s world championship. CAPTION: Cameron Karwowski in action in Cali.